I always keep a Dynamite Topical Aid Kit on hand. One of my girlfriends who lived half a country away had bought one from me and on the day of this rattlesnake bite, I was never more grateful that she did! I got a message at work to call my friend Cat ASAP. Since she would never normally contact me at work this way I knew something was wrong and I called her. She’d been up in the mountains with her dogs on a hike and one of them found a big rattlesnake. These dogs are working dogs and aren’t known for backing down, especially if there’s a threat to their handler. Her dog Hannah got bit by the snake, and from her description I’d say the snake didn’t pull any punches with the venom (not a dry bite). The others dispatched the snake. She was a couple of hours from the nearest emergency vet clinic. Thankfully Cat isn’t one to panic. She’s a thinker. So she went to work keeping her dog calm and getting her to the car. She’d already cleaned the bite site with peroxide. She knew I had pulled my old German Shepherd out of a hole (vets wrote her off as being too old to survive) after she’d been bitten near the eye by an unidentified poisonous snake. My old dog made it and Cat needed to know what I’d done. I had her clean with Solace, give it a few minutes, and then put the Miracle Clay on it. I told her, “Don’t just dab it on the bite site, coat a large area around the bite site.” I know this woman and her dogs very well and know they are on a natural diet and are extremely healthy and fit. In the beginning I told her to use her best judgment and to watch what was coming to surface on the clay. If it was getting dirty, clean it all off and go through the whole thing again. When my dog Dutch was bitten near the eye, I coated her whole head. For Hannah, I had her go 8 inches all the way around the bite site. I had her give Miracle Clay internally in broth made from green tripe. Cleaning the bite site and re-coating with Clay was done every half hour to an hour. When the swelling stopped as the clay drew deeper she changed it every 2 hours round the clock. In doing so, she also found, the next day, a 2nd bite site in the chest in a brindle streak of her fur. The swelling wasn’t as bad. She’d read online that Benadryl could help with breathing issues so she used that as well. This was continued until what she was seeing was this awful greenish color and finally black substance drawn out of her wound. I knew we were in the money once we saw that. Hannah is very well trained but for dogs who aren’t, keep in mind that they’re going to want to scratch as the drawing of the Clay must be itchy. Cat reported that Hannah acted like she had a bad headache for a few days. She was fed broth from green tripe which had been frozen and thawed. Later she boiled an organic chicken and fed her the broth from that. She continued with the clay until there was no swelling or heat at either bite site and there were no longer odd colors being drawn from the tissue. Surprisingly, within a couple of days, Cat was grousing that she was having a hard time getting Hannah to understand that she was not allowed to run around just yet. I was delighted. More over I’m forever grateful that Dynamite products were on hand to help Hannah survive two rattlesnake bites. I would never advise someone not to seek treatment from a doctor or a vet but even in modern day America, some of us still go places that take hours to come back to civilization. 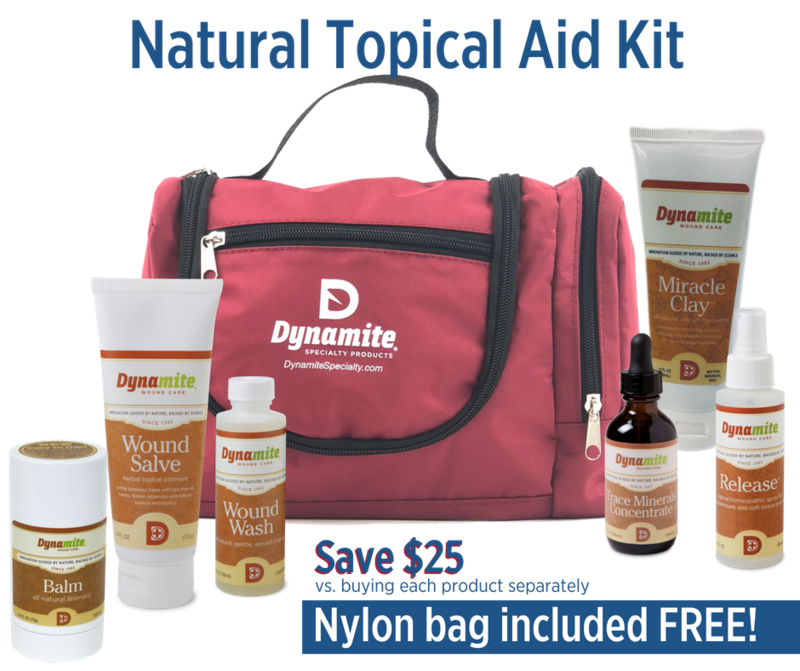 I never go anywhere without my Dynamite Topical Aid Kit. It’s small, it fits under the seat of any car and it could save a life.